Being at OOP 2017 in Munich was a great experience – not just because I had the chance to speak there and share my thoughts on softskills for tech people with my session on ‘interhuman debugging’ (in German). 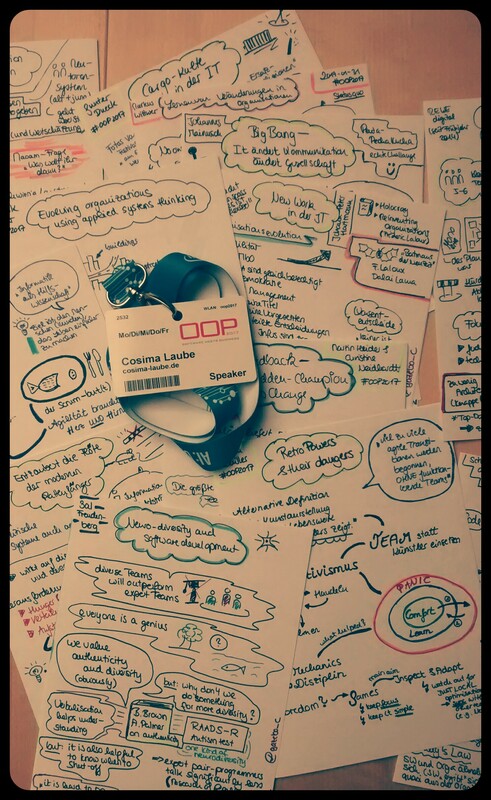 Of course, speaking at OOP was a great experience on its own. Being “just” my 3rd public speaking engagement, the positive feedback was overwhelming for me & I also loved the direct constructive feedback I got from a number of attendees as well as from a couple of more experienced speaker colleagues on how I can further improve my talks. Feedback is so utterly important and so I’d like to point out the OOP nightschool workshop on this ‘hidden champion’ delivered by Martin Heider & Christine Neidhardt. Have a look at their slides or at my sketchnotes to get a glimpse what this workshop was about. Marie Moe’s talk was just impressing for me. Cannot find other words. I learned a lot & had plenty of valuable conversations with friends and new people.